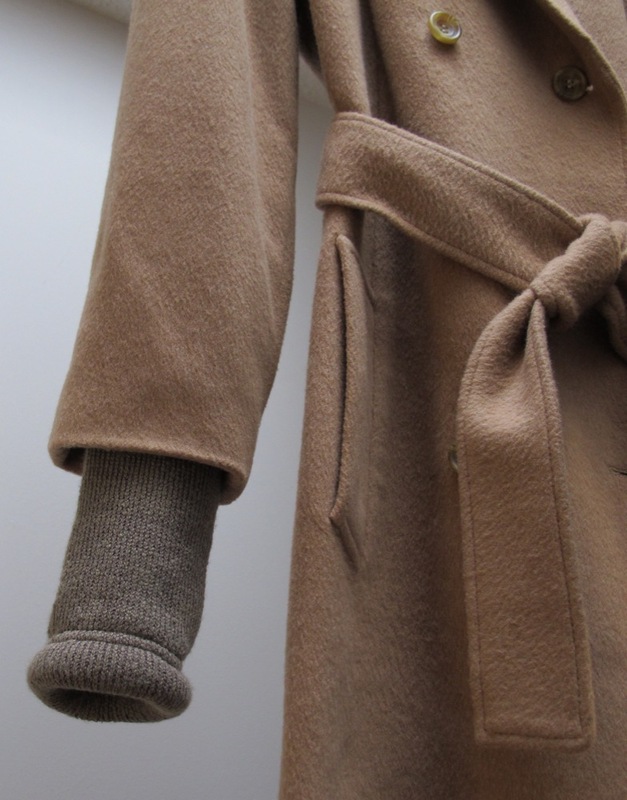 Adventures in Tailoring: Adding ribbed cuffs to a vintage camel hair coat and straps to a dress | Save. Spend. Splurge. Remember how I bought a few vintage items in December 2013 and then wanted to get them tweaked a little? 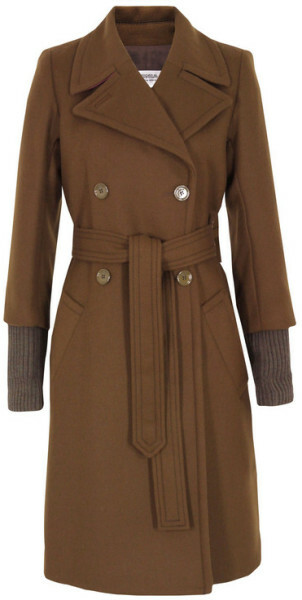 This is what the coat looked like before. Super soft camel hair (feels like cashmere), very comfortable, double-breasted (you can button up the double-breasted feature on either side!!) and the only little tiny thing was that the sleeves were too short. I thought about wearing long gloves with it, a long sweater, or trying to figure out something with the sleeves to make them stylish without being awkward and saw this Sonia Rykiel coat retailing for $950, and decided to take inspiration from it and add ribbed cuffs! I am pretty pleased with the result!! It is of course not as perfect as the Sonia Rykiel coat because I added the ribbed cuffs on AFTER the fact, and I’m sure the Rykiel coat has them sewn in from the elbows down, and they didn’t use cheap stretchy socks from a store, but probably bought real ribbed fabrics to make cuffs out of them. Still, the result is exactly what I wanted, my arms will stay warm and I do not need to wear gloves. It’s a really cute dress that pretty much fit me perfectly as-is. I like the flouncy bottom, the fact that all the stripes are not going the same way and the whole look of it. I really hated those cheap, stretchy white bra strap things on the dress. Yes, I could wear it as a strapless dress (they were removable) but I hate strapless dresses as well (I’m always tugging up the front part). Anyway, those cheap bra straps only made my shape (inverted triangle) look like I have even larger/wider shoulders, and in general it just cheapened the whole dress. I wanted actual straps so they wouldn’t slip off my shoulder, fall down or otherwise look crappy. I thought about using white cotton fabric but ultimately decided it would look too odd with white straps on a blue and white striped dress…unless I also decided to add white cotton fabric at the bottom hem or as the belt for a matching trim. I love that the stripes go up in another direction, the bust is horizontal, and the torso and skirt area are not straight stripes but on a diagonal. Now I don’t have to worry about the dress straps falling down (they’re quite thick and secure) and the overall look is fabulous for me. $28.25 ($25 before taxes) — Used sacrificed the belt that came with the dress. One of the best decisions I’ve ever made regarding adding straps to a dress. Sometimes my plans don’t work out, but this one did. I had also thought about folding the belt in half to make the straps thinner and not as wide, but ultimately decided the wider the better (for my shoulders anyway). Glad I went with my gut instinct. I am pretty much guaranteed that these two pieces don’t exist anywhere else in the world because if they did, they may not have made the same choices I did with the tailoring. I also like that now they’re pieces that are classic and timeless in my wardrobe for a fraction of the price that I would have paid had I tried to buy them at retail. I’m fairly sure a jacket like that 100% camel hair one (with the soft camel hairs not the cheap scratchy guard hairs) would easily sell for $2000 or more at retail. 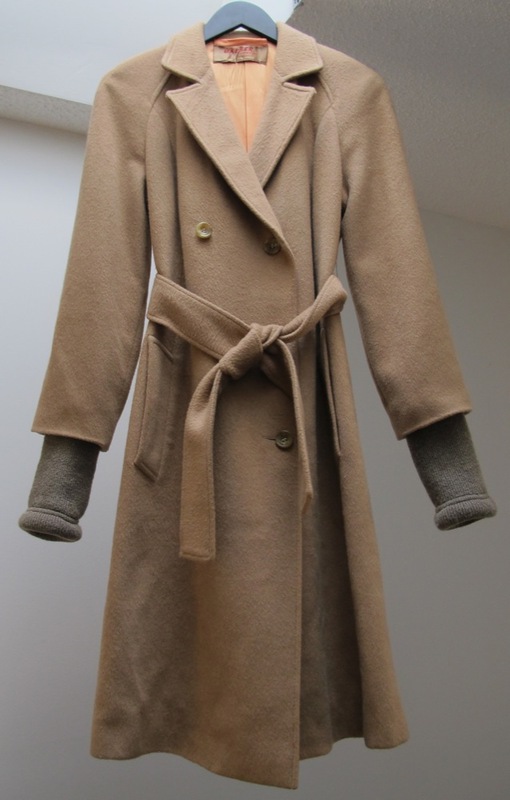 Max Mara has a wrap camel hair coat I was lusting a while back that is super soft like cashmere but was NOWHERE near as thick and as cosy as this vintage Jaeger one , and it retailed for $2000 CAD at Holt Renfrew! 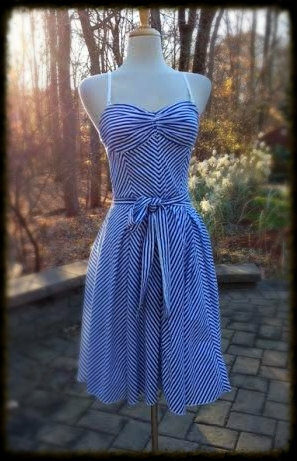 This blue and white striped dress for me, if it had been made by an independent designer, being 100% cotton, fully-lined and perfectly fitted, not to mention the work that went into making those stripes go on a diagonal and match up like that, would retail brand new for at least $100 if not $250 in some stores. Otherwise, you’re looking at polyester creations that won’t look quite as nice. ← Where do the richest people in the world live? Glad everything turned out so well! Where do you get your alterations done? Love it! Both came out great and I’m a fan of working with what ya got. Reduce, reuse & recycle! Vintage things are made so much better. I’ve been looking for a sewing box and everything is crappy, I’m just going to look for an old wooden vintage one. There’s a ton on etsy but I may check local craigslist first. For Coach/Dooney & Burke bags, I love the 80s ones if you rehab and clean them up, you can see the difference in the quality compared to today. @Tania: I heard that from others too, that Coach / D&B bags are better made in the past than today, which stands to reason. I’m glad it turned out so well for you – nothing ventured, nothing gained!! @SarahN: Cough cough, congratulations mum!! Absolutely. I’m glad I did it! Wow, that summer dress looks perfect! Thanks for the tips, I should start to look at my old clothes and see what I am going to do with it. It’s the only thing I can justify these days. Since I started reading your blog so many years ago I get clothing altered all the time. I love it. It makes my closet feel custom-made. @Bridget: That, and it’s cheaper than buying something new if you can just fix what you already own.